Box Text: Deep within enemy territory, your fellow countrymen are imprisoned. Only one man in the free world would dare attempt to save them. You, Stringfellow Hawke, commander of Airwolf. And yet, as you strap yourself into the cockpit of your supersonic jet copter, you know this is the most dangerous assignment you have ever flown. Headquarters knows that you have the skill and firepower it takes. You say you've got the guts...now prove it! 02-27-2015 pjboettcher Box Text Deep within enemy territory, your fellow countrymen are imprisoned. Only one man in the free world would dare attempt to save them. You, Stringfellow Hawke, commander of Airwolf. And yet, as you strap yourself into the cockpit of your supersonic jet copter, you know this is the most dangerous assignment you have ever flown. Your mission is mapped out. 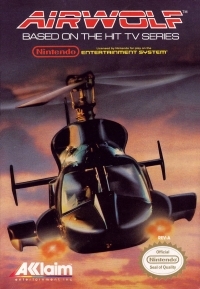 Airwolf's heat-seeking missiles and superpowered machine guns are fired up, ready to blow the terrorists away. But can you evade enemy radar time after time? Can you sneak behind the enemy lines, find the captives and bring them to safety before you crash land or worse? Headquarters knows that you have the skill and firepower it takes. You say you've got the guts...now prove it! 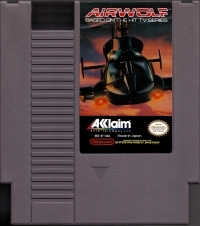 This is a list of VGCollect users who have Airwolf in their Collection. This is a list of VGCollect users who have Airwolf in their Sell List. This is a list of VGCollect users who have Airwolf in their Wish List.